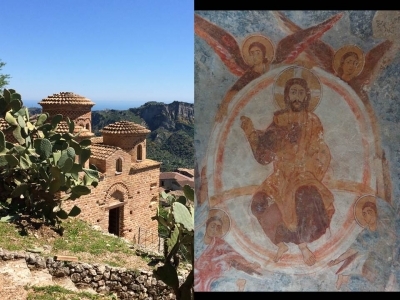 Cattolica Monastery in Stilo and Basilian-Byzantine complexes is part of the Tentative list of Italy in order to qualify for inclusion in the World Heritage List. This serial tentative site is made of 7 buildings spread along Calabria peninsula. We visited 6 of them during our tour in Southern Italy in April 2017, from North (we had visited Matera before) to South. They dated back from times when Byzance was ruling this territory and are said to represent influence of Eastern monks in the area. Most of them were following Saint Basil rules, hence the name of “Basilian Byzantine” monuments. Our first stop was in Rossano, were small San Marco church is located. The city is on top of a hill, overlooking Ionian see. The most difficult point was to park our car, then we easily found the cathedral in the middle of the old town and the Codex Purpureus museum (next door). This book (codex) is displayed in a small but recently refurbished museum and is said to be one of the oldest book in Europe, allegedly brought by monks from Syria who escaped from Muslim conquest in 7th century. This museum was a good introduction to the monuments we were about to visit. Friendly staff of the museum also gave us indications how to find the San Marco church, ten minutes walking distance from the museum and cathedral. The church is simple and very nice, just at the outskirt of the old town. Later in the afternoon we drove to the old monastery Santa Maria del Patire. It is a long, narrow road in the mountain. There was a convenient car park, the church was open, entrance was free and we were the only visitors. The interior was recently restored and shows parts of nice black and white pavement with mythological animals. Best part of the building for me is the apse of the church. We really enjoyed our time there. We then followed the road up in the mountain and soon entered Sila national park, another TWHS to visit and where we spent some time, therefore it is only the day after that we visited next buildings of this serial nomination: baptistery and Santa Filomena church in Santa Severina village. Such as Rossano, Santa Severina is built on top of a hill, however we easily parked at the bottom of the medieval castle, in the old part of the town. Baptistery is on the north side of the cathedral, which stands on the main square. Entrance is directly from the street, not through the cathedral. In front of the baptistery is a small bar and restaurant, whose owner is also the key keeper for the baptistery. Old columns inside still bear words and signs written in old Greek. Santa Filomena church is easy to find, along the main (only) road suitable for cars connecting the top hill part with the rest of the village, and we passed it by car just before parking. It looked also recently restored, with nice architecture details, such as doors and a pretty rotunda as tower. Unfortunately it was closed. When enquiring for possible inside access at the entrance of the nearby castle, we were told that interior of the church had nothing special and that best architectural value of the monument was what could be seen from outside: we were happy to believe that. After overnighting in Catanzaro Lido, our next stop was the Cattolica church in Stilo. Again Stilo is a top hill village overlooking the sea. Cattolica church overlooks the village, which result in a stunning location and is great for pictures! There is a convenient car park at the street. Of all these monuments, that one really looks like Byzantine churches in Greece (e.g. in Mistra) and is the highlight of the serial. Two Greek monks were the only other visitors. A man was staying in the church to give information, in particular to explain the paintings on the walls and ceiling: very valuable information and good way to practice Italian. Back to the car park, a kind of food truck seemed to be waiting for us, offering several kinds of products made with bergamot (a famous citrus only grown in Calabria): we can only recommend the delicious Bergamot ice cream. Finally we drove little bit further to Bivongi village, and from there to San Giovanni Teresti monastery. The road after crossing the bridge over the river is narrow and poorly maintained. The monastery was not in use for long time but recently monks came from Romania and settled there, they rebuilt part of the church which had collapsed. Choir and tower are the original parts of the monument. This a very quiet place, far away from the rest of the world. The seventh component of this serial nomination is a church in an archaeological park in Squillace, near Catanzaro Lido. We did not visit it. We really enjoyed those days looking for those buildings: it is always rewarding to visit a site after a hard drive, or after looking for a key. You obviously need a car. The six sites we visited were free of charge. Stilo church is open every day, all year round. We were lucky enough to be able to visit most of the other buildings. There is few (no) reliable information on opening times but as usual Italian people is friendly and willing to help if you ask them for. When preparing this trip, I had called “cooperative Neilos” in Rossano, who correctly informed me of the opening times of the monuments in Rossano, including San Marco church and Santa Maria del Patire. This part of Italy sees less tourists than other areas but is very beautiful and worth a visit.